Contributors this month include dronon, Equivamp, Fred, GreenReaper, Greyflank, InkyCrow, Patch Packrat, Rakuen Growlithe, RingtailedFox, and Sonious. Here's a book that you might not immediately think of as furry. Capricious: A Texan Tale of Love and Magic, by Julie Cox. 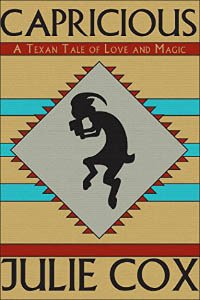 At first, the book cover resembles the Kokopelli rock-drawing designs from the American Southwest. But if you look closely, you'll note that there are hooves and horns and, by gosh, that's furry enough for me! Luke loves two things: his land and Sally. He pours a lot of magic and effort into one of them. The other he pretends to just like as a friend. Nobody is fooled except Luke. Circlet Press, June 2014, 305 pages, ebook $6.99, paperback $14.95 (US). An audio version can be heard on the Nobilis Erotica podcast. 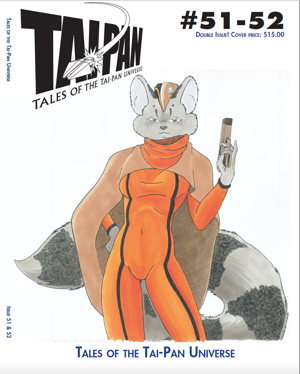 First off, let me engage in an act of self-disclosure: I recently finished writing Furry Nation, a personal history of the birth and growth of our community and its treatment at the hands of entertainment and news media that will be published in the fall by Cleis Press. I interviewed numerous furs for the book, unknown and well-known, Fred included. I found myself concerned it would be a conflict of interest for me to opine on Fred’s work, with the temptation to belittle it in comparison to my own. However I was happy to find Fred’s book unique in its own right. It is a work of scholarship I could never hope to duplicate. 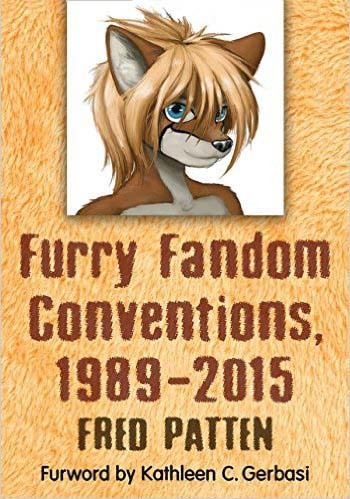 In fact, I wish it had been published a year or two earlier; it would have been an immense help to me in writing about furry conventions worldwide, a topic not covered in great detail in my own non-fiction work. Furry Fandom Conventions begins with a brief overview of the various kinds of furry gatherings and a succinct timeline of the fandom’s origin and spread. Even though the timespan covered is in the book’s title, the conventions themselves are described not chronologically but alphabetically, from the first “Abando” convention in Brazil in 2008 (with 15 attendees), to the last “ZonieCon”, held in in Tucson, Arizona in 2001 (57). The decision to alphabetize makes perfect sense: if you’re curious about say, Further Confusion, it makes it a lot easier to trace its history in one place rather than flip through the entire book looking for each year’s summary. 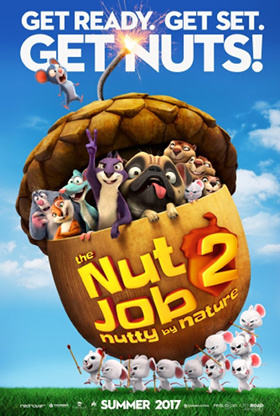 We covered animated feature The Nut Job thoroughly upon its release in January 2014. If you enjoyed it, I have good news: a sequel is coming August 18, entitled The Nut Job 2: Nutty By Nature. The Nut Job was about a group of anthropomorphized city wildlife led by Surly Squirrel raiding an out-of-business nut shop while a gang of bank robbers are using it as a cover for their heist. The movie is semi-famous for having been almost universally reviled by the critics before its release – it got a 12% rating on Rotten Tomatoes – then getting a very favorable audience when it came out. It was produced by ToonBox Entertainment in Toronto, and mostly financed by South Korean investors. The Ministry of Culture, Sports, and Tourism of the Republic of Korea got a credit. They even threw some love by having the animal cast plus an animated Psy, the popular South Korean singer-dancer, break into “Gangnam Style” over the closing credits. 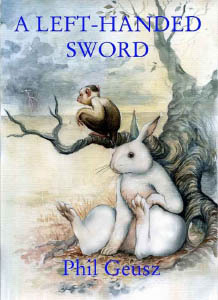 A Left-Handed Sword is a novella by Phil Geusz in which the characters used to be human beings. All of them have contracted a singular disease called the Lokiskur virus (Lokie for short), which has transformed them into animals. Lokie not only leaves its victims dehumanized and physically handicapped in their new forms, but often brain-damaged and depressed. They are also highly contagious; Lokie is an affliction that never lets go. Legion Printing, September 2011, 80 pages. Available in eBook and printed versions from Legion, Amazon and Barnes and Noble.